Thank you so much for your interest in the Flash Gives Back charity partners program! 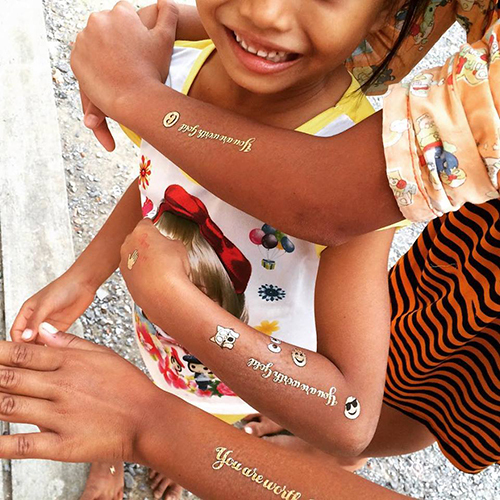 Flash Tattoos isn’t just about being fashion-forward – it’s also about shining a light on the causes that are close to our hearts. We take great pride in bringing awareness and action to create positive social and environmental change to make the world we live in a better place for everyone. Flash Tattoos packs are an excellent way to fundraise by creating a mini pop-up shop at auctions, events or galas. They are also a fun element to incorporate into awareness campaigns, such as social media promotions, gifts during mission trips, and much more! The Flash Gives Back charity partners program offers exclusive charity prices on selected collections. Qualifying charity and non-profit organizations are eligible to receive a special coupon code for 60% off all eligible packs. Eligible collections include: Chloe, Child of Wild, Dakota, Josephine, Lena, Nikki, Sofia and Zahra. 1. Coupon code can be used up to five times per calendar year – order quantity is not limited, but all orders are subject to review by the Flash Tattoos team. 3. When selling product for fundraising purposes, we request that the product price match the retail price listed on FlashTat.com. 4. Coupon code is only applicable for eligible packs included in Flash Gives Back charity partners program. 5. Coupon code is for non-profit or charity use only and is not for public use. We ask that the Flash Gives Back coupon code not be shared with friends or family or posted on any social media or public websites. Flash Tattoos reserves the right to reject or discontinue its affiliation with a charity partner at its absolute and sole discretion. Partners in violation of our terms may be released from the program and required to pay full retail price.